In the oral arguments for Utah v. Strieff, the Supreme Court’s liberals spoke up and won out. What happens when a police officer breaks the law? The cynical answer is, usually nothing. But since at least 1963, the legal answer has been very specific: Any evidence an officer collects by breaking the law must be excluded from the courtroom. This “fruit of the poisonous tree” doctrine is a component of the beloved, despised exclusionary rule, which typically bars evidence gathered in violation of the Fourth Amendment. Although conservative Supreme Court justices have chipped away at the exclusionary rule for decades, it remains a cornerstone of search-and-seizure jurisprudence. Law enforcement officers don’t get to enforce the law by breaking it. Pondering how far the fruit has to be from the tree to cease being poisonous can be an amusing philosophical exercise. 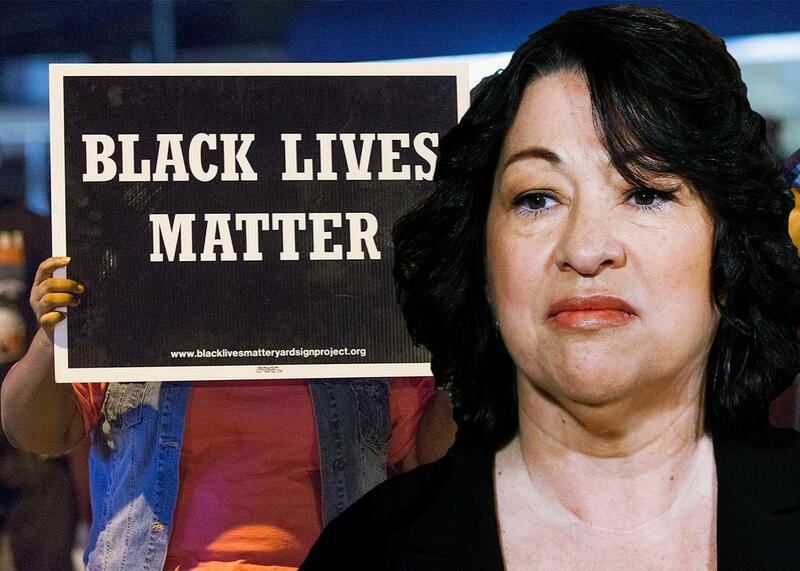 But, as Justice Sonia Sotomayor demonstrated during oral arguments in Utah v. Strieff on Monday, in impoverished minority communities like Ferguson, Missouri, the continued vitality of the exclusionary rule is no mere academic matter. On first blush, you might expect Strieff to be an easy case. Detective Douglas Fackrell violated the Fourth Amendment when he stopped Edward Strieff; Fackrell, Strieff, and Utah all agree on that point. The detective had heard an anonymous tip that a house in South Salt Lake might be involved in “narcotics activity,” and over the course of sporadic surveillance, he noticed visitors entering and exiting quickly. When he saw Strieff leave the house on Dec. 21, 2006, he detained him and demanded identification. Fackrell ran a warrants check and discovered that Strieff had an outstanding warrant for a minor traffic violation. So he arrested and searched him, discovering methamphetamine in Strieff’s pockets. One problem: The Fourth Amendment prohibits unreasonable searches and seizures. Fackrell’s search of Strieff’s pockets was probably legal. (To ensure their own safety, officers can generally search arrestees.) But Fackrell’s initial detainment of Strieff—in constitutional lingo, a “seizure of a person”—was not. At a minimum, officers must have individualized reasonable suspicion to stop and question somebody, even briefly. All parties agree that Fackrell did not have reasonable suspicion to detain Strieff after merely seeing him leave a house that might contain drugs. The seizure led to the search; the search led to the drug discovery. Under the exclusionary rule, then Strieff gets to suppress the evidence and walk free. Right? Not quite, because the Supreme Court has created an “attenuation” exception to the rule. Under attenuation doctrine, evidence discovered through police misconduct is still admissible if the link between the police illegality and the evidence itself has been sufficiently weakened, usually by time or interceding events. But the court has failed to explain how much time must pass, or which events must occur, before illegally obtained evidence becomes legal once again. In 1975, the justices focused on the “temporal proximity” between the police illegality and the discovery of the evidence (how much proximity? ); the presence of “intervening circumstances” (which ones? ); and the “flagrancy” of the official misconduct (a curveball with no relation to the other two factors). More recently, the court has switched tacks and decided that attenuation kicks in—and evidence becomes admissible—if suppressing the evidence would fail to serve any deterrent purpose. Some courts have interpreted these factors quite generously—including the Utah Supreme Court, which sided with Strieff and suppressed the evidence against him. When the U.S. Supreme Court agreed to review that decision, court-watchers assumed that the conservative bloc would continue its campaign against the exclusionary rule by broadening the attenuation doctrine. It could do so here by ruling that the discovery of evidence was sufficiently attenuated from the illegal seizure because of the intervening discovery of an arrest warrant. But that was back when Justice Antonin Scalia, noted exclusionary rule skeptic, was still on the bench. (Scalia once asked, “Why don’t we just abolish the exclusionary rule?” It wasn’t clear that he was kidding.) Following his death last Saturday, the justices appear to be deadlocked, 4-to-4, on Strieff’s case and maybe the exclusionary rule itself. Arguments begin with a bang, as Tyler Green, representing Utah, attempts to persuade the court that there was a clear attenuating circumstance here: Fackrell discovered an arrest warrant for Strieff, thereby breaking the chain of causation between his illegal conduct and his discovery of the evidence. Green wants the court to adopt a general rule that once an officer has discovered an outstanding arrest warrant, the “taint” of his initial illegality dissipates. Sotomayor jumps in. Green answers weakly that “an officer can never count on finding a warrant, so there is no incentive to make that stop.” Sotomayor hits right back. Everyone in the courtroom, including Green, looks a little stunned that Sotomayor went there. (Green, at least, should’ve seen it coming: Strieff’s brief heavily cites the Department of Justice’s investigation of the Ferguson Police Department.) Justice Elena Kagan leans forward with a mischievous grin to hammer home Sotomayor’s point. Kagan and Sotomayor make a compelling argument: If officers can justify an illegal seizure whenever the individual they detain turns out to have an arrest warrant, then there’s little stopping them from detaining whomever they want. Deterring police from engaging in this kind of unlawful activity is a fundamental justification for the exclusionary rule itself. So shouldn’t the court rule that an outstanding arrest warrant can’t justify an illegal seizure? Predictably, Justice Samuel Alito hops in to defend Utah, pointing out that most communities aren’t like Ferguson, and most people don’t have outstanding arrest warrants. Kagan pushes back, noting that the police are more likely to stop individuals in high-crime neighborhoods. When Joan Watt approaches the bench to defend Strieff, it seems as though she is inserting herself into a late-night dorm-room debate between Kagan, Sotomayor, and Alito. Watt reiterates the point that Utah’s proposed rule would encourage officers to detain anybody, even without an iota of suspicion. “There is a downside,” Alito insists. “If the officer makes an illegal stop, the officer exposes himself or herself to all sorts of consequences!” You can sense Sotomayor struggling not to roll her eyes. Police rarely face consequences when they shoot innocent civilians. Does Alito really think they’ll get in big trouble for detaining somebody unlawfully for a few minutes? Chief Justice John Roberts wades in with a nettled grimace to point out that most Americans don’t have arrest warrants, so the police don’t have an incentive to go on what Watt calls a “fishing expedition.” (Roberts seems increasingly irritated throughout the morning. Perhaps it finally dawned on him that his 5-4 majority against the exclusionary rule has gone up in smoke.) Watt, projecting an aura of stoic patience, calmly explains that officers “can still target communities that may have a greater incidence of warrants.” (She means minority communities.) Roberts has no good response. By this point, the battle lines are clear. The court’s liberals think that Utah’s rule would give officers a new reason to stop anybody and run a warrant check: If a warrant turns up, the illegality of the initial stop will be dissolved, and the officer can search his arrestee. Thus, to deter this behavior, the court should refuse to extend the attenuation doctrine. The conservatives, on the other hand, doubt that officers target communities where people have lots of arrest warrants, and doubt that applying the exclusionary rule here would deter police misconduct. Watt starts to answer, but Sotomayor cuts in with a brutal joust. It is one of those knockout moments so ruthless that you aren’t sure whether to cringe or cheer. Sotomayor is essentially calling out Alito’s privilege—why would he know about corrupt, scammy, racist policing?—and Alito doesn’t even attempt to respond. Instead, he wears an embarrassed smirk throughout the remainder of arguments, appearing appropriately shamed. By the time the justices file off the bench around noon, it seems probable the court will indeed divide 4-to-4, liberals against conservatives, on Strieff. That will leave the Utah Supreme Court’s pro-exclusion ruling in place, but fail to establish any nationwide rule. It would also represent one small conservative revolution thwarted. When Scalia died, court-watchers noted that his absence would forestall impending victories against unions, affirmative action, and voting rights. Less commented upon was the fact that the justice’s death also granted a reprieve to the Warren Court’s biggest contributions to defendants’ rights. The era of conservatives merrily hacking away at Fourth Amendment safeguards appears to be over. And Sotomayor’s aggressiveness on Monday suggests that, in the long run, she believes her side has the winning hand.